Sometimes you just get tired of plain salads, right? I know I do. So recently, I was looking for a way to spice them up from the usual while still keeping them healthy. I’ve been doing more cardio lately with P90X, and it was pretty obvious I needed some more carbs in my diet, so I decided to make a healthy try adding a mix some rice to my salad – a sort of salad, rice bowl mash up. And you know what? It turned out to be pretty darn tasty! The rice medley adds all kinds of flavor from the variety of healthy, whole grains to the salad and bulks it up, while mixed greens, berries and other fruits give it crisp, sweet flavors. Add some chopped chicken and feta cheese for protein, some healthy fats from the olive oil-based dressing (and optional chopped nuts), and you’ve got yourself a superfoods meal. Easy peasy. I hope you enjoy this unique combo as much as I did. Chop up rotisserie chicken or grilled chicken breast into bite-size pieces. Microwave rice according to package directions. For me, this meant microwaving the two pouches on a plate for 3 minutes. If adding nuts, cook them in a skillet over medium-low heat until toasted and fragrant, stirring constantly. 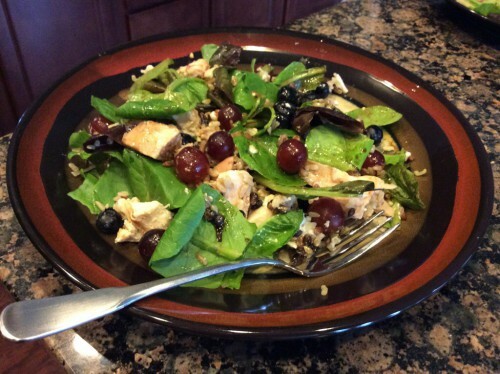 Combine rice, nuts, salad greens, chicken, grapes, blueberries and cheese in a large salad bowl. Whisk together balsamic vinegar, brown sugar, soy sauce, lemon juice, salt and pepper. Gradually whisk in olive oil. Divide evenly on to plates and you’ve got yourself a balanced meal. Great way to get your whole grains, antioxidants, protein and healthy fats all in one dish. 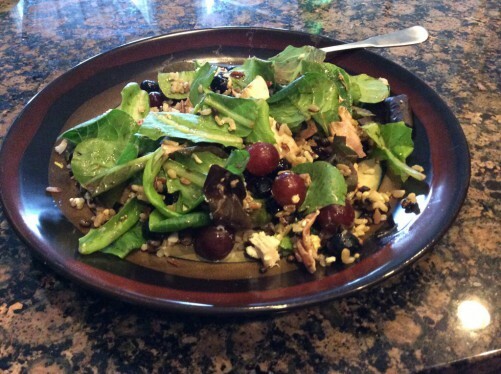 This entry was posted in Entrees, Recipes and tagged Balsamic Vinegar, Berries, Chicken, Chicken Salad, Entrees, Feta, Fruit, Healthy, Healthy Fat, Recipes, Rice, Rice bowl, Salad on August 17, 2014 by Paige N..